Individuals can now pass $11.18 million to heirs, free of gift, estate and generation-skipping transfer taxes; for married couples that exception is twofold, or $22.36 million. The Tax Cuts and Jobs Act of 2017 linked these exceptions to inflation, which means that they should continue to increase, albeit slowly, over the next few years. However, they will sunset in 2025 and the prior exemptions, $5.6 million and $11.2 million, respectively, will be restored. And that could happen sooner if the political climate changes. The incentive to act soon is clear. That doesn’t make it an easy decision, however. Thoughtful, properly designed trusts can be a powerful tool in fulfilling a family’s long-term financial objectives, while avoiding cause for regret. The first consideration has to be supporting your own lifestyle. Do you have enough to maintain your standard of living and meet your other personal financial objectives? If there’s any ambiguity, a spousal lifetime access trust, or SLAT, may be the right solution. Assets are gifted to the trust to utilize the increased exemption amounts but are not includible in either spouse’s estates, nor subject to additional generation-skipping taxes when property passes to younger generations. The beneficiary spouse retains access to the gifted property in the event it is needed. This can be important if circumstances change and the grantor and spouse need to recover some of the gift put in the trust. Just as important is to consider whether your income would be sufficient if the beneficiary spouse dies before the grantor and the couple loses access to the gifted property. Divorce could also be another issue to consider. In the event of divorce, the beneficiary spouse’s status terminates, putting an end to his or her ability to receive trust distributions. Also, the grantor no longer has access to the gifted property. Concerns that children aren’t ready to inherit can also delay decision-making. Placing property in trust now would allow the grantors to utilize the current exemptions while designing the terms of the trust to determine when and how funds are ultimately disbursed. The approach can also protect the assets from future creditors, or divorce. There are other good reasons to act while the current law remains in effect. For example, are you holding promissory notes from prior estate-planning transactions? If so, consider utilizing some of your increased exemption amount to forgive these notes. Are the values of assets owned by one spouse greater than the increased federal exemption amounts and greater than the value of assets owned by the other spouse? If so, consider transferring assets to the less-propertied spouse to take advantage of the increased generation- skipping tax exemption, which will shelter assets passing to grandchildren and great-grandchildren from further tax. Say, for example, you plan to leave your children and grandchildren $10 million in your estate at your death, and you die in 2026 after the increased exemption expires. Under this example, your estate would have incurred both federal and state estate taxes of about $1.6 million. If, on the other hand, you create a trust now, your unified credit and generation-skipping tax exemption could be used to offset all taxes attributable to the gift. 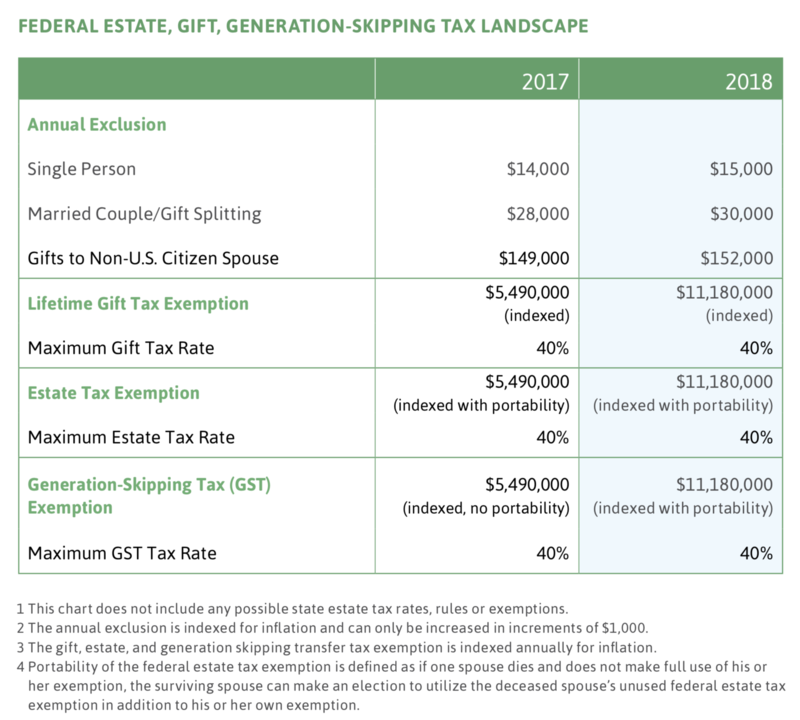 In addition, you could save on state estate taxes, as lifetime gifts are generally not subject to state gift tax (unless you live in Connecticut). That said, we recommend coordinating any gifts with your legal and tax advisors to better understand your specific state transfer tax rules. Further, any appreciation earned on the trust assets would benefit your family and not be subject to tax in your estate. The potential compounded growth of the portfolio at 6.4% could allow an additional $8.4 million of assets to pass to your family without additional tax. Now is an important time to review your current estate plan and to re-evaluate whether your plan is meeting your family’s overall objectives. Karen Francois is a Partner and Wealth & Fiduciary Advisor at Evercore Wealth Management and the Chief Fiduciary Officer at Evercore Trust Company, N.A. She can be contacted at francois@evercore.com.